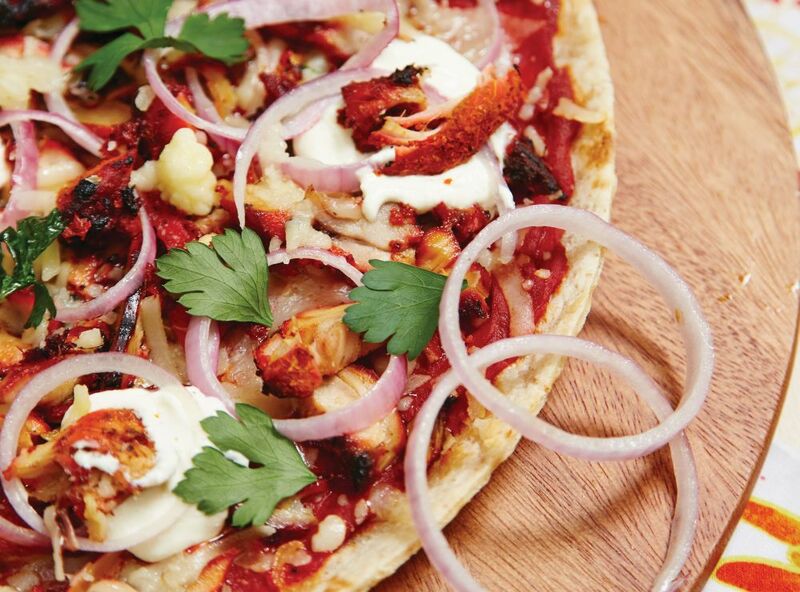 Tandoori Chicken Pizza with Sour Cream and Onion prepared with Mission Pizza Crusts will surely be a crowd pleaser. Recipe and photo courtesy of Mission Foods. Put peeled tomatoes in a strainer and remove some of the excess water. Then place strained tomatoes into a food processor, add a pinch of salt, a pinch of oregano and if you like, a spoon of olive oil. Set aside. Heat oil in a small pan over medium heat, then cook the coriander, cumin, turmeric, cayenne, garam masala and paprika, stirring often until fragrant. Let cool completely. Whisk in the cooled spice-oil mixture into the yoghurt, then mix in the lemon juice, garlic, salt and ginger. Cut deep slashes (to the bone) in 3-4 places on the leg/thigh pieces. Just make 2-3 cuts if you are using separate drumsticks and thighs. Coat the chicken in the marinade, cover and chill for at least an hour (preferably 6 hours but no more than 8 hours). Prepare your grill so that one side is quite hot over direct heat, the other side cooler, not over direct heat. If using charcoal, leave one side of the grill without coals so you have a hot side and a cooler side. If you are using a gas grill, just turn on one-half of the burners. Use tongs to wipe the grill grates with a paper towel soaked in vegetable oil. Take the chicken out of the marinade and shake off the excess. You want the chicken well coated, but not too much marinade. Put the chicken pieces on the hot side of the grill and cover. Cook for 2-3 minutes before checking. Turn the chicken so it is brown (even a little bit charred) on all sides. Move chicken to the cool side of the grill. Cover and cook for at least 20 minutes, up to 40 minutes (or longer) depending on the size of the chicken and the temperature of the grill. The chicken is done when its juices run clear. Let it rest for at least 5 minutes before serving. It’s also great at room temperature or even cold the next day. Remove meat from the chicken and slice it into thin strips. Place wholemeal pizza crust on a baking tray. Spread tomato sauce evenly over the surface of the pizza crust. Generously sprinkle shredded mozzarella, sliced tandoori chicken and sliced onions over the pizza. Bake the pizza in the oven (180°C) for approximately 5 minutes or until the mozzarella melts. Remove pizza from oven, cut the pizza into slices and place some sour cream on top. Sour cream can be made easily by whisking a cup of cooking cream with the juice of one lime.